It feels a little ridiculous to lead in with another apology—my second apologetic intro in the only two newsletters I've managed to send out this year. But sometimes the winds of life get a bit blustery and command your attention. This year has been one of those. Writing has taken on a much greater role and unfortunately most of my words are going elsewhere—at least initially. Over the course of the last six months I've conducted interviews with the trendy: deadmau5 and Girl Talk; the legendary: Portishead and DJ Harvey; and, of course, those rising out of the underground: James Blake and Visionquest. I'm pretty proud of all this. Many of these chats will be included here. There's a new mix too, one that I actually completed months ago—so pardon the few, obviously dated inclusions. Some technical shifts sent us researching new servers, how to transfer our podcast along with it and alternative ways of hosting our sets. All that's completed now... Six months later. Whatevs, we're back, we're improved and we hope you still like us. Where we're slacking in letting time pass, we're also remaining timely—with our ideas and our coverage anyway. This month, Spin magazine dedicated its entire issue to the surging electronic music scene. I'm happy to report that, in some sort of DJ-Music-Collective-Consciousness type of thing, I wrote a similar think piece about a month back. In it, I discussed how dance music in the '90s was an overpriced import and now its a freshly-packaged domestic—big, brash and full of bass. (Spin took a very similar angle—In another odd parallel, we both even cracked jokes about the VP and his R.A.V.E. act.) For someone that's worshipped dance beats for more than a decade, now truly feels like our time. And that's what I'd like to leave you with. 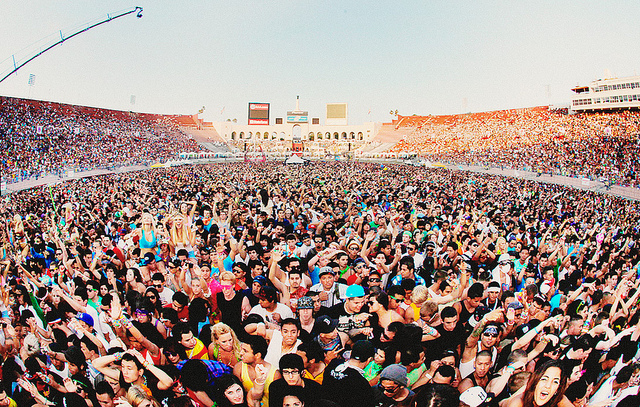 Dance music in the U.S. is bigger than ever. Will it last? During a recent visit with the fam, my 18-year-old brother wasted no time in firing up iTunes and sharing his newfound love of electronic-music club-fillers Pretty Lights, Skrillex and Rusko. I’ve been living and breathing this music for more than a decade now, but at his age, the closest I came to the rave world was DJ Shadow and the Prodigy’s “Firestarter” on CD single—remember those? Does this mean my brother is cooler than me? Eh, probably. But it is also a testament to how much house music’s thump, electro’s growl and dubstep’s bass whomp have pervaded popular culture. My brother’s taste actually puts him on the fringe of this dance-music surge when you consider that French superstar David Guetta is conjuring anthems for the Black Eyed Peas and his protégé Afrojack is doing the same for Chris Brown and Pitbull. This barrage of beats coming over the airwaves is matched by the rhythms frolicking forth from this summer’s festival speakers. Ultra and Electric Daisy Carnival are more successful than ever; the latter has expanded to dates in five cities. Here, Lollapalooza more than doubled the size of its DJ stage—all the better for dancing in the mud—and put the scene’s world-famous rodent on the main stage. Last weekend, Labor Day’s North Coast Festival all but gave over its entire lineup to rave-worthy acts including both Rusko and Guetta, a game plan it’s sure to maintain. Speaking of rave, we’ve seen this beat-driven hype before. In the ’90s, we got our first taste of electronic dance culture courtesy of big beat. The Chemical Brothers, Orbital and the pyromaniacs of my youth were supposedly destined to change the face of popular music forever. And while those acts and the candy-colored mega parties they headlined did make a permanent impact on the underground dance community, the biggest lasting impression was an Ecstasy backlash and a hangover. Dance music didn’t stick around last time for two reasons. First, as progressive as American ears can be, we weren’t ready for it. Record labels saw electronic music’s popularity in the U.K. and Europe, wanted to cash in on it here and imported sleek foreign acts to sell to us like Mini Coopers. When radio didn’t bite and sales didn’t spike, they abandoned it to warehouses and Midwestern cornfields. Second, with the exception of a few, most kids were in it for the drugs and not the music. The year 2003 saw the RAVE act, or Reducing Americans’ Vulnerability to Ecstasy, and not just the corporate world but the government sent us to those cornfields. So what’s different this time? Not the drugs—sorry, Vice President Biden. The change here is that the music is being embraced wholesale, with fist-pumping arms. Homebred hit makers like Diplo are showing up in BlackBerry commercials, LCD Soundsystem’s James Murphy is a disco-loving demigod, the summer festival season is one big corporate-sponsored rave, and overseas stars like the Swedish House Mafia and Tiësto are getting upwards of six figures to turn our shores into a second home. Like my brother, the U.S.A. may be the younger sibling that’s late to the party, but we’re here now and we mean business. Which, of course, also means big business, and that’s a language all Americans understand.